Sag Harbor behind the breakwater. Clear waters, fun people watching, charming colonial village, shopping, good anchorage, great food - what more could you want in a northeast cruising destination? Truly, Sag Harbor has it all. Including proximity to the Hamptons, the ultimate playground for the rich and famous and wannabees to boot. Colonial buildings replete with historical significance. There is plenty in the picturesque village to remind us of the rich history of Sag Harbor and surrounding communities. The earliest inhabitants of this region were the Algonquin Indians. They called it Weg-wag-onuch which translates loosely into "the place at the end of the hill". Neighboring villagers called this area Great Meadows. Sagaponack, south of Sag Harbor, benefited greatly from the convenient location of the 'Great Meadows', with the harbor providing an excellent port from which to ship goods. They called the place Sagaponack Harbor or the Harbor of Sag. East Hampton records indicate that Joseph Stretton inherited the land from his father in 1698. Although records indicate that there was no permanent settlement until late 1730, Southampton Town records first mention Sag Harbor by name in 1709. 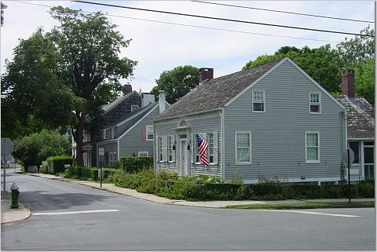 Sag Harbor grew through the 1700s by several subdivisions of land. From 1760-1850, the Village was a thriving whaling port. Shipbuilding was an established industry and trade with the West Indies was active. As a seaport, Sag Harbor was second only to New York City in importance. It was the first Port of Entry in New York State, having been established one day before New York City. At that time, the Village had more tons of square-rigged vessels engaged in commerce than New York City did. The customs house is certainly worth a visit and is preserved in the condition one would expect of those times. Whaling history exuded in the architecture.The First Presbyterian "Old Whalers" Church. The steeple, which stood 165-feet high, was blown off during the great hurricane of 1938. During the Revolutionary War, the British set up strong garrisons and naval blockades preventing the passage of supplies from Sag Harbor to the American Army. Many of the residents fled to Connecticut. Those who remained were robbed, plundered and forced to feed and house the soldiers of the Crown. On May 21, 1777, Colonel Return Jonathan Meigs performed a brilliant exploit at Sag Harbor, when he with about 100 men rowed in whaleboats across from Connecticut to stage a raid to reclaim Sag Harbor. In the surprise attack, lasting one day and without any casualties to his men, his troops destroyed the supplies held there by the British. He was honored by Congress and presented with a sword of thanks. After the close of the war, the majority of those living in exile returned home and started anew. Col. Meigs was later appointed Indian Agent for the Cherokee Nation and served from 1801 to 1823. On March 26th, 1846, the Port of Sag Harbor was incorporated as a village. Shortly after, the whaling industry began to decline, and although whaling continued for another twenty years, it was never as robust as it had been between 1820 and 1850. The villagers next turned to industry for a living. Early industries included a brass foundry, hat factories, watch makers, mills (sugar, cotton and flour), bottlers, potteries and water works. Bulova Watchcase Factory, E.W. Bliss Torpedo Company, Agwam Aircraft Products and Grumman Aerospace all had operations in Sag Harbor. In 1981, Bulova was one of the last of the industrials to depart. The Village of Sag Harbor, an area encompassing 2 square miles, lays claim to a few additional "firsts" beyond the first port of entry in New York State: the first Fire Department in the State of New York in 1803 and the first Village east of Brooklyn to have gaslights in December of 1859. Now, the Village relies on the tourist trade for its revenue. Go forth and spend so the villagers can prosper! 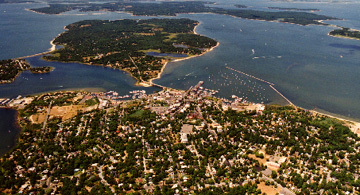 Aerial view of Sag Harbor. 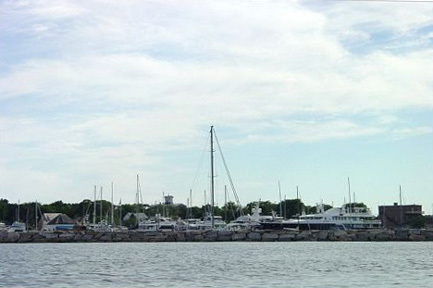 Note the mooring field inside the breakwater and the proximity of the village to the waterfront. Newsday article about the history of Sag Harbor.